Absolute print surface perfection and high-speed production can be achieved with the Arkay RC-1100SS Stainless Steel Cut-Sheet Print Dryers. After the print passes through the front rubber squeegee rollers, nothing touches the print except warm, dry air and soft bottom-rotating foam discs that move the print to the rear of the dryer onto a wire-dried print receiving rack. The RC-1100ss will accept prints as small as 3" wide by 5" long. Adjustable heat and speed controls. Combination squeegee and blotter roller system. Under dryer drip tray and rear detachable print receiving rack is included. 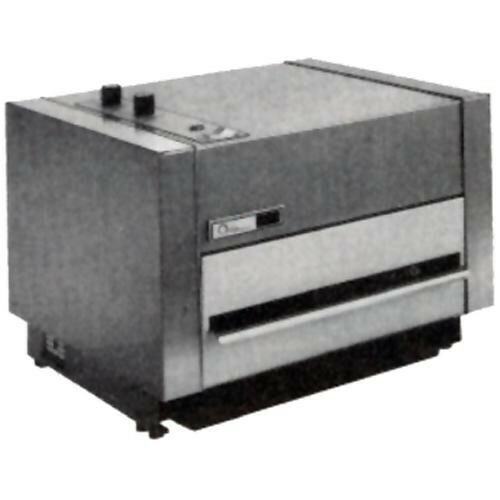 Electrical 220 Vac, 50/60Hz, 9.2Amps, 5700Btu/hour maximum. Maximum Paper Width Up to 12" wide. Drying Rate 300 8" x 10" prints per hour. Box Dimensions (LxWxH) 28.4 x 18.6 x 17.2"
Do you sell this in 110 voltage for regular household plugs?